23 compelled to make an instrument on their own resources. The first reflecting instrument was invented by John Hadley early in the summer of 1730 and a second, improved form of it was made shortly afterward. He gave a description of it to the Royal Society in 1731. An American named Thomas Godfrey in October 1730 presented a gentleman in Philadelphia, James Logan, with a description of an instrument almost like Hadley's. Logan gave an account of it. 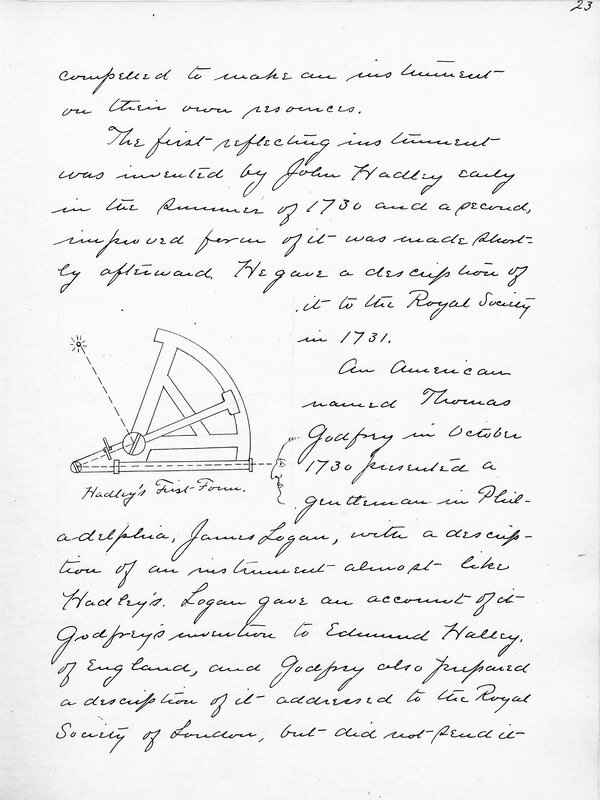 Godfrey's invention to Edmund Halley of England, and Godfrey also prepared a description of it addressed to the Royal Society of London, but did not send it Hadley's First Form.